This is the DEMO version of the product. A file may contain up to 1000 trades on any symbol. The Times and Sales to csv utility allows storing the Time & Sales to the hard drive. This valuable information will always be at hand and it will be useful for testing the trading algorithms and analyzing the history data. The utility is an indicator, which does not plot any charts and has no input parameters. 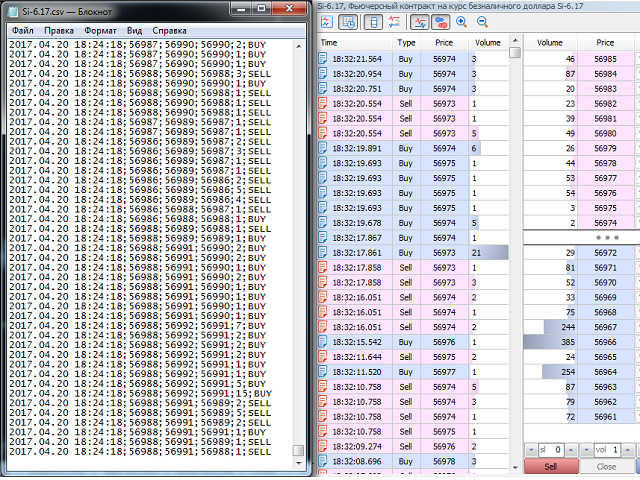 Its purpose is to write data quietly, without interrupting the trader. The indicator automatically subscribes to the appropriate price data. There is no need to open the depth of market for the instrument. Attach it to the chart. After that you will obtain a file with the trades in the Files folder of your terminal. The file does not have a header. Only lines with data. Attention: the terminal must be running at all times! This is due to the peculiarities of obtaining the price data. Changed the time format. Now the indicator stores milliseconds.